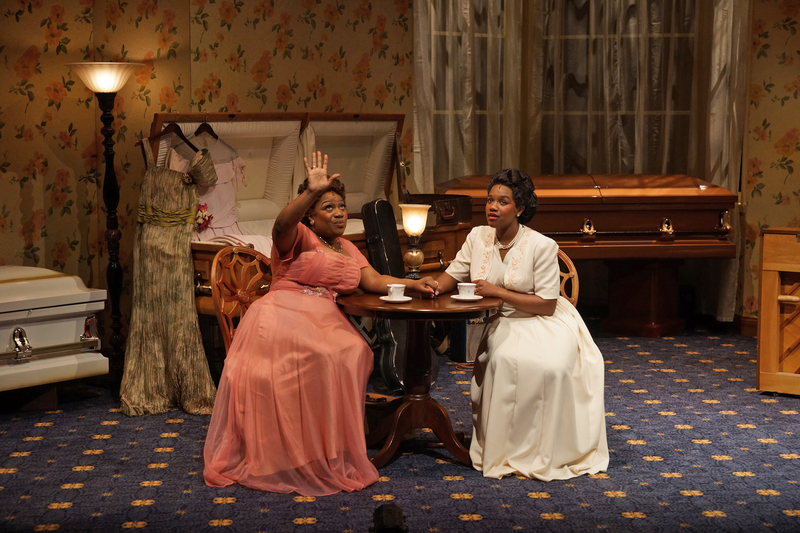 Rajané Katurah Brown (as Marie) and Jamecia Bennett (as Rosetta) in Park Square Theatre’s production of Marie and Rosetta. Photo by Petronella J. Ytsma. Rosetta Tharpe was a swinging gospel music star who also played rocking secular music. A well-known name during World War II, she was a major influence on a variety of later music stars such as Elvis, Ray Charles, and Jimi Hendrix. Despite her fame and influence, however, recognition of her important role in the gospel and rock sound faded, and her name became unknown to many, including myself. Playwright George Brant’s play Marie and Rosetta, which recently ended its run at Park Square Theatre, brings this talented singer and musician back from the obscure and shares her legacy with another generation. Under the direction of Wendy Knox, Brant tells the story of Rosetta (Jamecia Bennett) through her professional relationship and friendship with her young protégé Maria Knight (Rajene Kuturah Brown). It opens in a funeral parlor in Mississippi the day after Rosetta hired Maria to tour with her. She introduces Maria, who has lived in the North, as to what it is like to tour in the South when your are black. Because of their race, they are unable to stay at hotels/motels and depend on the kindness of others to provide them with a sleeping and rehearsal place such as the funeral parlor. Instead of playing clubs or concert halls, they set up in road houses, barns, etc. to hold their concerts. Marie (Rajané Katurah Brown) and Rosetta (Jamecia Bennett) enjoy a rare moment of rest. Photo by Petronella J. Ytsma. Brant’s dialogue works well in the first half as both the two women get to know each other while the audience also learn about both. Maria has a steady history of performing gospel and has reservations about being associated with Rosetta’s more secular bluesy music. Rosetta is trying to reestablish herself as a gospel star while continuing to pursue her secular music. One of the best scenes is when the two performers work together on a song and Maria keeps asking Rosetta to tone down language and movement in the song to make it more respectable. With great frustration, Rosetta attempts to placate Maria until it gets too much. But Maria loosens up and the two women begin to make beautiful and rocking music together. Bennett is hilarious as Rosetta and often spellbinding when she gets her electric guitar going. Kuturah, as Maria, manages the right amount of being prim and proper in the beginning and when she loosens up you can see why the two become such good friends. The second half largely becomes a discography of Rosetta’s music under the musical direction of Gary D. Hines. The music is great, but the pacing of the first half gets lost. Rather than have the two performers simply sing a long list of songs, the show’s dynamic might be better served by transferring the singers to a concert stage, pulling away the furniture and adding lighting and musicians to let Rosetta really rip with her electric guitar. As a play, the second half could also benefit from tweaking. But even with these flaws, the show makes for a wonderful evening for its light shone on an influential musical artist from the past. Jamecia Bennett and Rajane Katurah Brown’s encore tribute to Sister Rosetta Tharpe and Marie Knight plays January 13, 2019 at the Dakota Jazz Club in Minneapolis, MN.